Are you thinking of moving or relocating to Orange, California? Would you like to know what the quality of life is like living in Orange? This part of California is truly a paradise, in that the weather is not too cold and not too hot, all year round. It rains a little in the fall and winter, but not enough to make you wish you weren't there. The summers are just about perfect and if it ever gets too hot, which is rare, then the beach is just a few miles down the road. The Southern California winds known as Santa Anas blow through Orange a couple of times a year. These winds touch just about every part of California's lower counties but are only considered a bit inconvenient by most Orange residents. Orange is an interesting blend of rustic old fashioned Americana thrown together with the steel and glass high rise anonymity of the 21st century. The new buildings give it a feeling of "Hey, look at us!" while the Old Town district seems to gently insist upon genuineness and realism. That is, the Old Town area is simply more fun to be around because it harkens back to an era that doesn't exist in this country anymore. It also makes you wish that Old Town existed in every city, not just Orange. 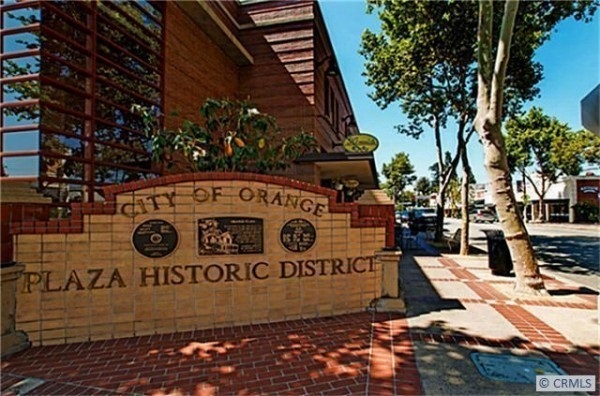 The general consensus as to what is the best part of Orange to live in is around Old Town. That's where all the great restaurants and shopping are and tat's where you can walk around and window shop and feel very secure. There are also several schools, colleges and a famous university is located, so the area is occupied by a seemingly more gentile crowd than at the average mall. Some of the less sanguine parts of town, shall we say, are to the north of the Old Town section, which cuts into Garden Grove and Anaheim and to the far west of the town, which borders Westminster and the city of Santa Ana. Every college town provides ample opportunities for singles, and Orange is no different. Even if you're older than college age, there are innumerable clubs, restaurants and Old Town to peruse for your soul mate. Newport Beach and other great beach towns are only a few miles down the road. The Block at Orange is a terrific mall and it's actually a great place to spend a day or just a few hours. It has pretty much everything: great stores, restaurants and movie theatres. Old Town is the pick of many discerning shoppers, however. It's truly a wonderful getaway and you can find great food, antiques galore and simply good shopping. Orange Hill Restaurant is one of the finest you're going to encounter in Southern California. It actually sits on a small hill in Orange and has some of the best food and finest service in the county. Gabbi's Mexican Kitchen serves remarkable and authentic Mexican food. Orange has some very good public schools. This city is known as an educational center within the county and besides its public schools, there are several colleges and the famous Chapman University. St. Joseph Hospital and UCI Medical Center are the hospitals to go to when you need one. These are world-class medical centers. Freeway noise is all you have to worry about as far as that kind of pollution is concerned. The 5, 57, 22 and 55 freeways all cut their way through Orange. Old Town is the nicest place in Orange. If you're going to visit something in this city, see Old Town. On the other hand, Disneyland is only five minutes from Old Town.